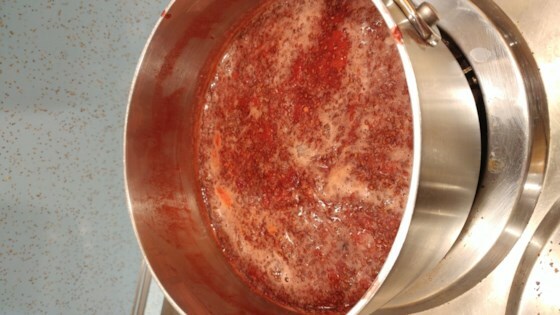 "Healthy and amazingly yummy jam! Enjoy right away or keep in airtight container for up to two weeks." Soak chia seeds in water until mixture has a jelly-like texture, about 5 minutes. Heat raspberries, blackberries, blueberries, strawberries, and honey in a saucepan over medium heat until berries are soft, about 15 minutes. Lightly crush berries with a fork or masher. Stir chia seed mixture into berry mixture. Remove from heat and let cool for at least 10 minutes. This is a great base recipe for any chia jam you might want to make! I used strawberries and rhubarb! Oh my goodness, it turned out so well! Love this! I made these adjustments per what I had available; agave instead of honey and costco's frozen "nature's 3 berries" and their frozen strawberries. Came out great! We made this yesterday and my kids went through the entire batch. We're making more tonight! Great recipe. To much honey for my taste though. Will add a tad less next time. I blended cooked fruit with vita mix and added white sugar. Turned out great! Next up: blue grapes from ontario...I think it'll taste like concord grape jam. A little tart. But OMG easy. Was looking for something to do with frozen berries. Very good alternative to regular jam; no pectin and uses way less sugar. Definitely a healthier jam.